The third smallest sovereign nation in the world has just made an enormous contribution to relieving the world's debt to the environment. 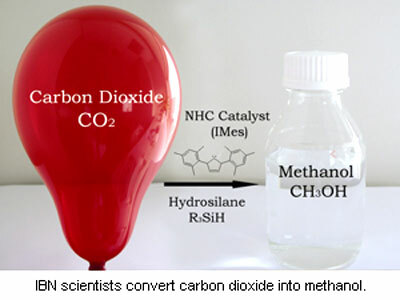 Singapore researchers at the Institute of Bioengineering and Nanotechnology (IBN) have discovered how to turn carbon dioxide into methanol.... Double take: They have found a way to make greenhouse gas green. Triple take: They took the biggest contributor to the world's carbon footprint and converted it into a source of clean energy for the world. Astounding. In case you're not jumping out of your skin yet, the IBN research was immediately sent to Angewandte Chemie, published by the German Chemical Society, and the prestigious journal called it a "hot paper," and "very important." In layman's terms, what IBN researchers discovered is that if they used N-heterocyclic carbenes (NHCs), an organic catalyst, as opposed to heavy metal catalysts, carbon dioxide is activated, a state which it must be in to transform it into something useful. Then, hydrosilane, a combination of silica and hydrogen, is added to the NHC-activated carbon dioxide and, by adding water into the solution through hydrolysis, the carbon dioxide transforms into methanol. Sony Reader vs Amazon's Kindle - Battle For e-Readership! This doesn't make sense. Carbon dioxide and water have a lower total bond enthalpy than methanol, which means it takes at least some energy to make them into methanol, catalyst or no. Not only that, but it is the same energy you get when you burn methanol, for obvious reasons. I can see how this would work for fixating some carbon dioxide, but *definitely* not as a fuel source. At the least, this is pretty misleading. I agree with the post above. It doesn't make sense. It will be front page news once they figure out how to do it without using more energy than it produces. But it takes energy to make this happen, and that energy is likely produced by a power plant that... produces carbon dioxide. Anybody read the original info? Why don't you read it... or read the study itself... and then provide an educated analysis. We will now have a new technology to not fund enough money too, or the energy companies can buy and hide .....yeah! And if energy needs to be put in, you can do it with renewable resources. Wind, solar, water... all can provide enough energy to convert to the methanol. Then the methanol could be transported to a region unable to produce its own/enough energy. burn it, maybe recover the CO2 and send it back for reprocessing..
Now take this process as a guide, shove it through the "School of Amazing Yankee Doodle Scholars and vicious vulture capitalist shysters" and come up with the final product, a Solar powered plant in the South Western U.S.A. that makes Methanol from Solar Power and C02, benefiting from the huge and inevitable carbon taxes coming soon to the homeland (sic) and producing what amounts to, in Yankee terms, liquid solar energy! Holy fvck! and economic miracle! and if done to grand American scale, a reason to break out the Corvettes, Cadillacs, Escalades, and Mustang super cars again, and get GM to build them to boot! ... but this isn't an energy or greenhouse solution. The laws of physics require that the amount of energy required to convert carbon dioxide to methanol must be at least the amount of energy that you can get out of converting methanol to carbon dioxide by burning it. So the process is very interesting from a chemical engineering point of view, but not from an energy source point of view. 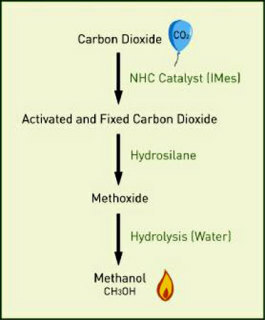 You *should* be able to produce methanol from carbon dioxide using this process, but you put considerably more energy into making the methanol than you can get back out of it as useful energy. The process could have some utility in situations where you must have a liquid fuel and are starting with a non-liquid fuel source (such as electricity), but this is in no way an environmentally "friendly" scenario. I think you are missing the point... We are talking replacing gasoline here. It takes the same energy input and water to process oil to gas, but this could break oil dependency. It certainly is not as green as they make out, but I think the final numbers will show at least a 5-10% improvement over oil to gas, and get rid of some CO2 in the process, and say bye bye to the mideast political problems when they run out of cash over there. I would like to see the final NET results of this process though. Yups! Thats right and think about the cost of transport for all the fuel oil that we would save. This could be a good start. Not sure about the green-ness. There is that CO-2 we would be getting rid of so maybe it would be better than regular gas? Where are all the math chemist dudes when you need them? attempt to wake up global warming goon squad. Errm squeeze me all you global warming peeps but... Fact, CO2 is good for plants, it is actually their 'food'... hence CO2 is good for the environment as plants make up the majority bio mass and all animals depend on plants. Hence CO2 "pollution" is GOOD for the environment... so why the F convert it to methanol?.. and if anyone says, "but CO2 is global warming...", serioulsy, do some research. CO2 is at historically LOW levels in Earth's history. Earth's averge CO2 atmospheric concentraion is many times greater then it is currently today. News flash, extra CO2 in the atmosphere does not cause warming. Never has, never will. It is commonly known ( among those who bother to inform themselves,) that the historical evidence we have shows that fluctuations in CO2 levels in the atmosphere FOLLOW temperture variations by about 800 - 2000 years. News flash 2, at the time Eric the Red was colonising Greenland Earths average temperature was a couple of degree's warmer then today... there was no catastrophic melting, no flooding, the world didn't drown, there was no terrific storms that destroyed mankind, most importantly, there was no 'industrial CO2!' On top of these minor facts it should be noted that mankind flourished, growing crops where he never could have before, expanding and colonizing and multiplying... so why are we daemonizing CO2 again? oh that's right, because the MSM told us to.... baa, baa, baaaaaa. CO2 is great for plants, and extra CO2 is even better for the plants, at least for only a couple years. Experiments have shown (can't find them right now, they are bookmarked at home) that after the 2-4 years of growth, the plants would actually fare worse and would be at production levels less than what they are currently. Well there is never going to be a way of doing this to produce more energy than it takes in, that is fundamentally impossible. We then use the methanol in cars, trains, whatever, releasing CO2. Meanwhile a plant somewhere produces methanol, using the CO2 from the cars (now in the atmosphere) to produce more methanol. Because renewables are used, it is carbon neutral. Essentially, it is a way of converting all that pesky CO2 into a power source! Looks like hydroxysilane is a waste product from the reaction of CO2 with a hydrosilane. Now if we could actually get a photoactivated cleavage of hydroxysilane with some workup steps to get hydrosilane (probably impossible IMO, but you never know), you have man's first artificial photosynthesis machine. That would be amazing. seems to all depend on how one acquires the agent "hydrosilane" and what its costs and opportunity costs are. if it is something that needs to be synthesized, we have a non-starter on our hands, but if it is widely available and otherwise useless, then the entire process amounts to a way to effectively exploit a new resource... which certainly DOESN'T require violation of the second law of thermodynamics in order to be beneficial. Hydrosilane is a hydrocarbon, still leaves oil dependance. It's very easy to turn CO2 into ethanol. Step 1 - plant hemp seed. Step 2 - allow hemp to grow - utilizing the naturally occuring supply of CO2 to flourish. BTW... whenever the TV weatherman gives the day's record temps - the high is almost always in the 1920s/30s - and it can be by as much as 30 degrees. The UPCC has dropped a great number of it's scientists, in order to fabricate a consensus. to suggest that CO2 follows temperatures rising, same as there is none to suggest the temperatures follow the CO2 levels. i think its better to be safe than sorry. also you say that CO2 is good for plants... well done, but there is far too much CO2 for plants to process, especially with widespread deforestation in the amazon and other places like that. chill out and stop being so sarcastic.